Devon Prep senior Connell White with the village of Leogane, Haiti, in the background. Leogane is the site of a hospital staffed by University of Notre Dame. Just over two years ago a devastating earthquake hit the small country of Haiti destroying the capital city of Port au Prince, killing thousands of people and leaving even more homeless.The country received aid from around the world in the months after the earthquake, but two years later the needs of the Haitian people continue to be great. 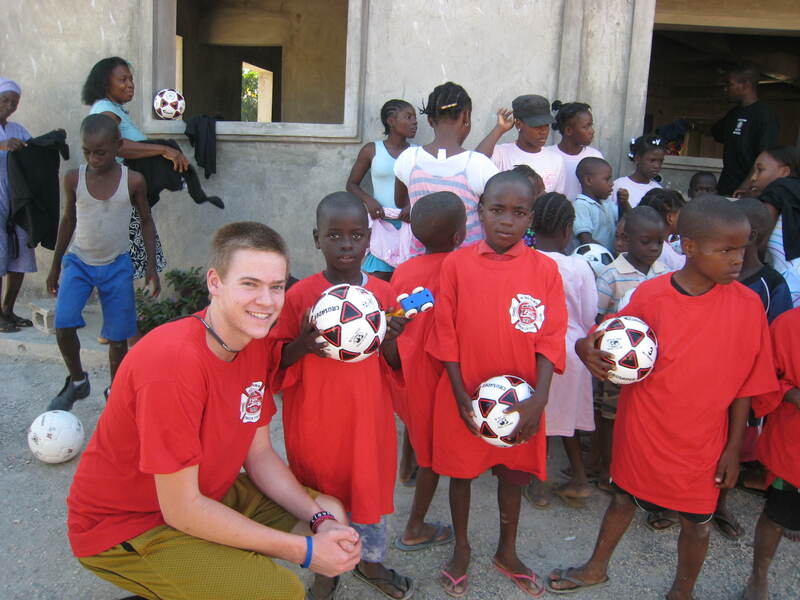 Devon Prep senior Connell White at Mary Queen of the Apostle Orphanage in , where he distributed soccer equipment donated mostly by the Haverford Township Soccer Club. White was in Haiti with his father, Dr. Francis J. White, and about 20 others, who had been invited by the University of Notre Dame to visit a hospital-research center in Leogane staffed and funded by the university. Leogane is located just 18 miles from Port au Prince but the drive takes 2-3 hours on dirt roads filled with pot holes and debris made even more difficult by the earthquake. The purpose of the trip was to recruit physicians, engineers, architects and volunteers to help improve the quality of life through Notre Dame’s Haiti Program (http://haiti.nd.edu/). Founded in 1993 this program is a world leader in the fight against lymphatic filariasis (LF), a disfiguring, mosquito-borne disease that afflicts more than 2 million Haitians. During his visit Connell went to Mary Queen of the Apostle Orphanage, where he distributed soccer equipment donated mostly by the Haverford Township Soccer Club. In addition he visited an all girls’ elementary school, two hospitals, a leper colony and a market place. He also attended a lecture on LF, and Mass at the St. Rose of Lima Church. Back at Devon Prep Connell is finishing up his senior year and enjoying all that goes with it. However he hasn’t forgotten his experience in Haiti. In fact Notre Dame is at the top of his list of college choices. His father is an alumnus. If he gets in, volunteering for the Haiti Program may be a possibility.